Steele Stanwick (6) and the Machine will be gunning for their fifth straight win tonight against the visiting Bayhawks. All-Star Game festivities are over and the Ohio Machine (5-3) is back on the grind this week when it returns home to Selby Stadium to take on the Chesapeake Bayhawks (4-4) tonight at 7 p.m.
Oddly enough, the Machine took on the Bayhawks the week following its first bye week of the season — a game the Machine won 12-9. Ohio is currently riding a four game win streak and a win on Saturday would tie the club record of five wins in a row. On the other hand, the Bayhawks have lost three of their last four, but did manage to defeat Denver 15-12 in their last outing. Here’s all you need to know before heading to Selby for the showdown. 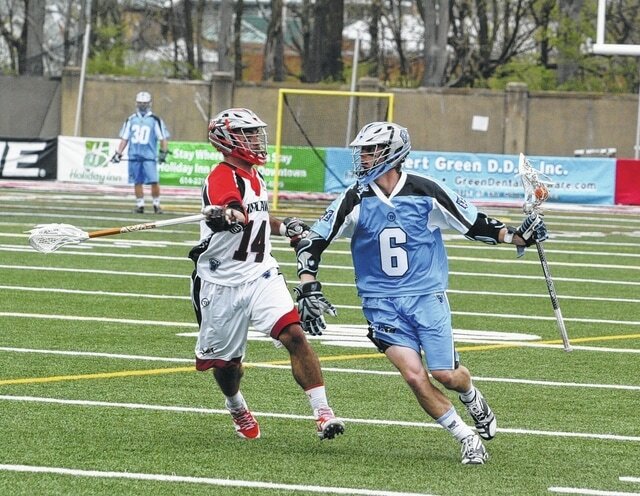 Offensively, the Machine is led by Marcus Holman, who is forth in the league with 22 goals this year. However, Peter Baum was the offensive leader before having to sit out three games due to injury, and he returns for the Machine this weekend. Baum was able to get a slight tune-up by participating in the All-Star Game last week, and the Machine think he is ready. Last time out against the Bayhawks, Baum and Tom Schreiber both recorded hat tricks for the Machine, and the team has gotten better offensively since then. Over the last four games, Ohio has averaged 16.5 goals per game, which is more than four more goals per game than their first four matches. The Machine offense will have its work cut out for it though, as Tyler Fiorito, the Bayhawks’ goalie, is only giving up 12.25 goals a game. The Machine defense has been on a tear lately and is only giving up a little over 12 goals per game this season. The Bayhawks are only scoring 12.5 goals a game this season, so the defense should keep Chesapeake at bay offensively. The Machine will have to keep an eye out for a few Bayhawk players on Saturday. Most notably Jack Rice, who leads the squad with 14 goals, and Matt Danowski, who has 15 assists this year. Bye, bye, bye: Since the start of the 2014 season, the Machine has won three straight games when coming off a bye or off week. Keep an eye out for the Machine to continue that pattern as it has already defeated Chesapeake once this year following a bye. Coach Davis thinks the week off is good for the team overall. A helping hand: Tom Schreiber leads the Machine in points, and while his 14 goals are impressive, his assist game has been huge on his way to 33 points on the season. Watch for Schreiber to eclipse an assist milestone against the Bayhawks as he only needs to add one more for his season total to reach 20. Home sweet home: After two straight road games, the Machine returns to the friendly confines of Selby Stadium. This season, the Machine is 2-1 at Selby Stadium, having won its last two games in Ohio.